Sewing birthdays parties for kids in Melrose, MA. 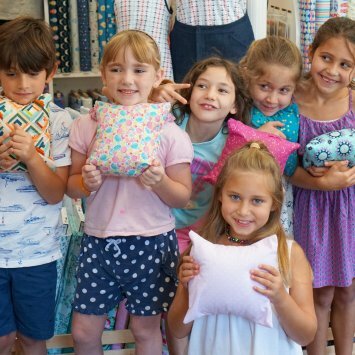 Celebrate your birthday with a custom sewing party! We will provide all of the materials and equipment needed for each guest to make a fun project. Parties last 1 hour and 45 minutes to give us plenty of time to go over the basics, finish the project, and enjoy cake or food. Guests do not need prior sewing experience. All of the machines will be threaded and ready to go, so all you have to do is show up and have fun. Please contact us to discuss a time for your party. We can accommodate about 12 guests. Party favors - each guest will get a goodie bag with a sewing kit and some fun sewing related items.